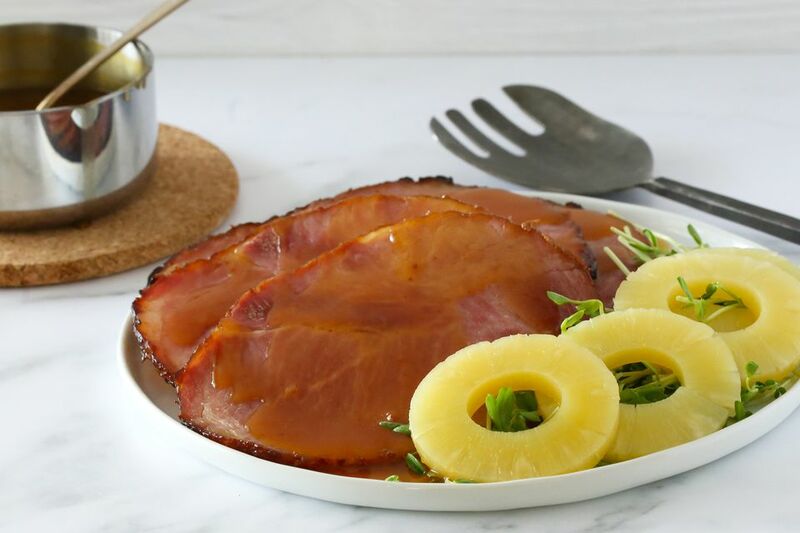 Beer and brown sugar get together with a bit of vinegar and mustard to make a delicious glaze for this baked ham. The ham bakes to perfection with beer, and then it is glazed near the end of the cooking time. Don't discard the cooking liquids left in the roasting pan; they make a super-flavorful sauce to drizzle over the sliced ham. Serve the ham with mashed potatoes or sweet potatoes and your family's favorite side dishes. This beer and brown sugar glazed ham is an excellent choice for a holiday meal. Preheat the oven to 350 F. Place the ham, flat side down, in an uncovered roasting pan. Pour 1 cup of beer over the ham and bake it for 1 to 1 1/2 hours, or until it registers about 135 F. Baste with the pan drippings every 15 minutes. Meanwhile, combine the brown sugar, flour, dry mustard, and vinegar in a bowl; add just enough using enough beer—a tablespoon or two—to make a smooth, thick glaze. Remove the baked ham from the oven and score the fat diagonally in a criss-cross pattern. Stud the ham with whole cloves, if desired. Skip scoring and the cloves if the ham is spiral-sliced. Spoon the glaze mixture over the ham. Bake the ham for about 10 to 15 minutes longer, or until well glazed. The internal temperature of a fully cooked ham should be at least 140 F for best flavor and texture. Serve the ham sliced; drizzle with the cooking liquids, if desired. A fully cooked USDA—United States Department of Agriculture—inspected ham can be eaten uncooked, but cooking improves the flavor and texture. The recommended temperature for a fully cooked ham is 140 F. If the ham is not labeled fully cooked, cook it to the minimum safe temperature of 145 F. For any ham that was not USDA inspected and unpackaged or leftover ham, cook to 165 F.
How much ham should you buy? For each serving, calculate about 4 to 6 ounces per person of boneless ham, or about 6 to 8 ounces per person of bone-in ham. A 4-pound boneless ham should feed approximately 10 to 12 people. A 4-pound bone-in ham should serve about 8 to 10 people. If you prefer to cook without alcohol, use unsweetened apple juice and apple cider vinegar instead of the beer and wine vinegar. Replace the beer in the glaze mixture with few tablespoons of orange juice along with a dash of nutmeg. Replace the dry mustard with 2 teaspoons of grainy mustard.